Black & Decker 3-Way Adjustable Trigger Nozzle Only $2.99! Down From Up To $11.99! 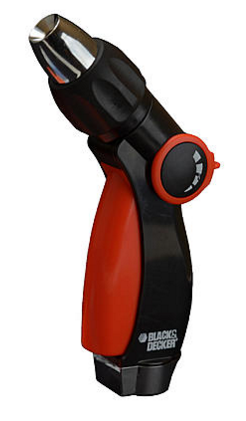 You are here: Home / Great Deals / Black & Decker 3-Way Adjustable Trigger Nozzle Only $2.99! Down From Up To $11.99! Sears has this Black & Decker 3-Way Adjustable Trigger Nozzle on sale for $2.99 (Reg. $11.99)! Plus you can get FREE shipping on orders over $35 or FREE in-store pick up! Use this Black & Decker Adjustable Trigger Nozzle on your hose to wash your car, then focus the stream to loosen up the dirt and grime on your tires, rims and hubcaps. Easily switch to a gentler stream to wash your convertible top, exterior paint or windows. The spray is adjustable by just a twist of the nozzle so you can switch back and forth to the type of water spray you desire. The adjustable spray feature is also excellent at watering your outdoor hanging plants, flower beds or vegetable patch.